I took the default guild bank window and made it about 25% smaller so that it didn't look as out of place with the bag and bank mods other people have made that I am using. i bin ja echt begeistert, voll fett und easy bisi...gschissn is des echt mal goa ned heasd. sers, und an greana schoas dahoam, ääähh an scheena gruas dahoam. 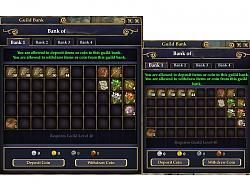 I love the tiny guild bank!! I would love to have a 3.4 normal bank window to go with it (hint hint!). I like the normal bank positioning and setup, it just doesn't need to be that big. I made this version while half awake and still drinking my first cup of coffee this morning. Let me know if there are any problems with it. looks good. may i ask what bag mod you're using? Thanks, I think this came out pretty well for my first mod attempt. I am pretty sure that I am using Ger's 3/4 multi-format bags and Mortis Bank but I would have to double-check when I get home to be sure.